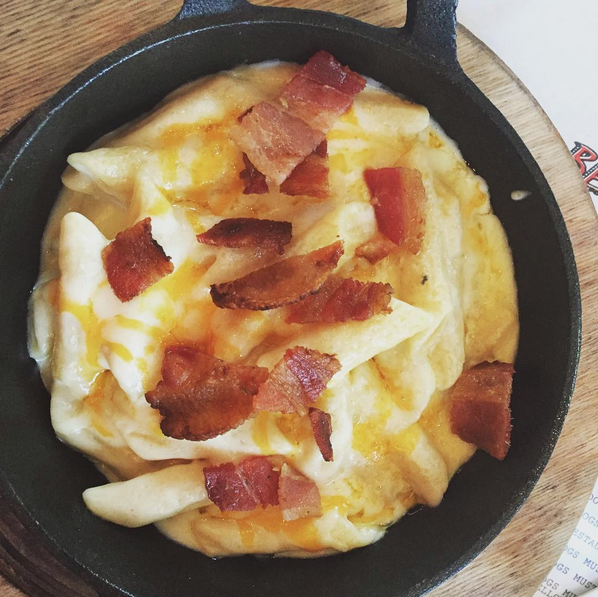 Wine Country visitors and residents: you MUST try Bear Republic's Brewers Mac and Cheese. I had tried this mac and cheese once before with friends, but had a hard time mustering up the energy to truly judge it since we had just spent the day lounging by the pool and day drinking at Francis Ford Coppola Winery down the way. Yes, hard life, I know. So when I found myself eating there again this past Saturday, I felt compelled to try it again and give it a proper review. It was great. So great. I love the flavors in this mac and cheese. It has jack, cheddar, American, Parmesan, and a blue cheese bechamel sauce. I usually don't even like blue cheese, but it really works well in this mac and cheese. You can get it plain, or with bacon and/or jalapenos. Since I tend to avoid super spicy foods, I went with the bacon. Okay, I admit, I also just really love bacon. The texture is very creamy and cheesy and I just love that. The portion size is rather generous, as I remember from my first visit. On this trip, however, a friend and I split the dish and it was just the right size. We both felt full, but not stuffed. With all that said, I have to explain why this mac won't be making it into my top ten, and I may get a lot of flack for it. While AWESOME, I have a really hard time thinking of Healdsburg as part of the direct Bay Area. It's a over an hour outside of San Francisco, and I tend to think of wine country in general as it's own entity. I mean that in the BEST possible way. I mean, I don't get excited about visiting another part of the Bay Area, but I sure do get excited about visiting wine country. So, yeah, I guess that's my reasoning. Sorry If that offends anyone. So, again, if you are in that area of northern wine country, GO. Go get yourself a mac and cheese. Oh, and maybe some of their famous beer offerings as well. Let's not forget that.